Members of the NC State community spent the summer making an impact on campus and around the world. 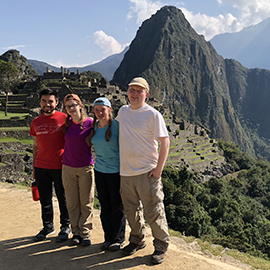 From learning and conducting research to engaging in acts of service and even a little relaxation, students created lasting memories at home and abroad. Here are a few of their stories. This summer I gained a few more stamps on my passport and made lifelong friends. I started my adventurous summer traveling with Bookbag Tours to live with a host family in London in June. The group was composed of teachers from across the U.S. who then met up in England and had professional development and observed in London schools. I shadowed teachers from reception through year six at Oasis Academy: Ryelands. After our time in the school came to a close, we explored the city and took a day trip to Paris. I took off on my next adventure to Zambia in July with Beyond the Gate Missions. 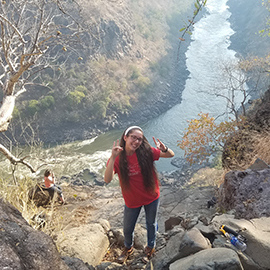 The group is headquartered in Raleigh and is passionate about witnessing to the people of Zambia, securing clean drinking water in remote villages, and providing education to students through child sponsorships and assisting in building and maintaining schools. I visited Green Acres Basic School and Kalomo Basic School — two of the schools where the Beyond the Gate team sponsors students. We planted fruit trees, checked in on church building projects, prayed with villagers, and visited the land the ministry just received from Chief Mukuni and the royal establishment. The trip wasn’t all work and no play. 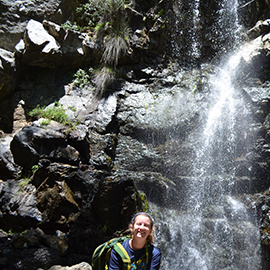 We hiked down the gorge at the land, went to Victoria Falls, and closed out our trip going on a safari in Botswana. 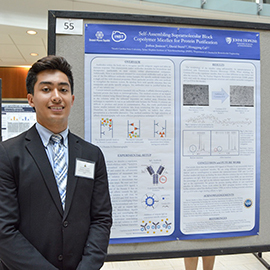 This summer, I had the amazing opportunity to conduct research in the Johns Hopkins Institute of Nanobiotechnology Research Expriences for Undergraduates in Baltimore, Maryland. As a student who has never had the opportunity to work in a research setting, my summer has been such an enlightening experience for me. Having the chance to learn a variety of different lab procedures including cell culture and mice handling was an eyeopener in the life of the scientist that I’ve always wanted to become. Within the Cui Lab, my project consisted of working to develop a new method of purifying antibodies for immunology purposes. Plus, I was able to present my poster that the Johns Hopkins Medicine Annual Symposium which strengthened my confidence in sharing the work that I really enjoy doing. Before the research program, I was unsure about pursuing research as a career, but now I can only picture my future job working in a lab. This summer I had the wonderful opportunity to study abroad in Amman, Jordan with Qasid Institute’s Summer Intensive Arabic program. Over the course of two months, I spent four hours each day, five days a week, studying Modern Standard Arabic in a classroom setting. Through this immersive experience, I was able to strengthen my Arabic speaking skills by communicating with the people in the beautiful city of Amman. Beyond academics, I had the opportunity to visit some of the wonders that the country has to offer, including Ajloun, Wadi Rum, Petra, Wadi Mujib and the Dead Sea. 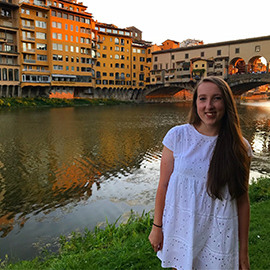 This summer I spent a month studying abroad in Florence, Italy. I have always dreamed of visiting Europe so when the opportunity to study in Italy presented itself, I was extremely excited. During my time in Italy I learned so much about the culture and history of the country not only through my class but also my experiences. From climbing Mount Vesuvius to exploring the canals of Venice, I saw so many magical and inspiring sights. I will always look back on this experience with pride and awe at what I was able to see and accomplish with the help of NC State and the Goodnight Scholars Program. 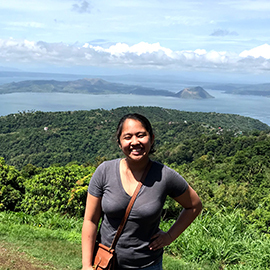 Over the summer, I traveled to the Philippines! I’m a first-generation Filipino American, and this was the first time visiting the country where my family is from. For a month, my family and I traveled all over the main island of the Philippines. We went from the beaches to the mountains, and we stopped at more fruit stands, restaurants and sights than I could count along the way. It was also so intriguing to see how life in the Philippines was so different than life here, while at the same time some aspects were the same. Though, I admit, I had my fair share of cultural shocks along the way! This trip was invaluable to me not only because it was a great vacation — probably the best one I’ve ever gone on — but it gave me the chance to explore my ethnic and cultural identity in a way I could never do back home here in the United States. 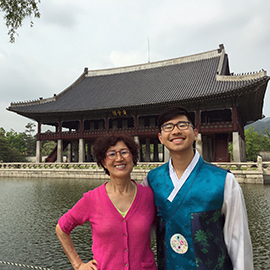 In May, I went to South Korea for two weeks for the first time in 10 years with my mom. In her words, she moved to the U.S. with my dad with only $300 in one hand and a rice cooker in the other. So it was amazing to see my mom’s home country and to be old enough to appreciate it. We stayed in Seoul (where most of my mom’s family lives) and also visited her hometown, Suncheon. The whole time made me more proud to be Korean-American, as this was the first time where I looked around and everybody looked like me. It was great to learn more about my roots and consequently feel more grounded in who I am. 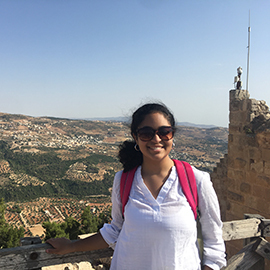 This summer, through the generous provision of the Goodnight Enrichment grant and the Fellowship Advising Office SUPER-Curricular Seed Grant, I was able to spend two months in Limassol, Cyprus, at the Cyprus International Institute for Environmental and Public Health. I spent my summer learning, developing and implementing various algorithms to evaluate predictors of obesity in adolescents ages 12-18. I pooled my data from the Center for Disease Control and Prevention’s National Health and Nutrition Examination Survey, a long-term lifestyle and nutrition study with publicly available data. I had never done anything like this before, so between being in a new country and a new work environment I learned something completely new almost every day. This summer, I and three other students traveled to Peru and hiked the Inca Trail up to Machu Picchu. It was a four-day, three-night adventure in the mountains spanning 50 kilometers. I went alongside two other Goodnight Scholars — Mason Collier (class of 2018) and Stephanie Menten (class of 2020). 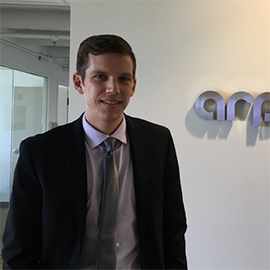 This summer, I worked as a Technology-to-Market Scholar for the U.S. Department of Energy’s Advanced Research Projects Agency (ARPA-E) in Washington, D.C. I had the fortune of working alongside some of the most successful clean energy innovators in the country, and I truly believe the experience shifted my career path toward one that is impactful and rewarding. I have always been deeply passionate about clean energy technology development, so the opportunity to work at ARPA-E was a dream come true. My project at ARPA-E was focused on decarbonizing the agricultural sector by designing and modeling an innovative process that integrates multiple cutting-edge technologies currently being funded by the Department of Energy. Ultimately, the process I designed converts air, water, and agricultural residue into ammonia fertilizer and high protein micro-algae animal feed on a modular scale and without any fossil fuel inputs. My main advisor at ARPA-E conducted research and development at Exxon Mobil for nearly 20 years, so his insight into clean energy development was out of the ordinary and highly valuable. As I continue my pursuit toward a Ph.D. in the Department of Forest Biomaterials at NC State, part of the work I conducted at ARPA-E will be included in my dissertation. In addition, I will continue collaborating with the connections I made this summer to enhance the remainder of my Ph.D. research. I would like to give a special thanks to my Ph.D. advisors, Drs. Sunkyu Park and Hasan Jameel for granting me the opportunity to spend a summer away from NC State. I’m excited for what lies ahead! 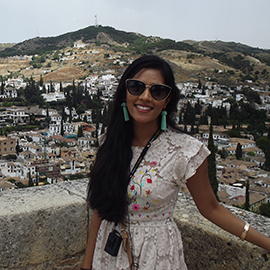 This summer I studied abroad in Valencia, Spain, where I took classes in modern Spanish art and Spanish culture. I also traveled around Spain to Granada, Cordoba and Barcelona. 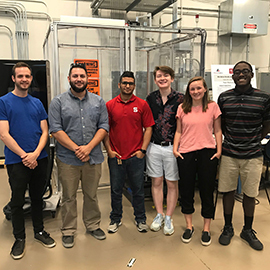 This summer, I participated in a Research Experience for Undergraduates (REU) at the FREEDM Systems Center on NC State’s Centennial campus. The FREEDM Center is an National Science Foundation (NSF)-funded engineering research center that focuses on developing a safe, reliable and sustainable smart electric grid. I was drawn to this experience because of my passion for sustainability and renewable electric energy. I learned from esteemed professors and graduate students and collaborated with undergraduates from different engineering backgrounds and universities on technical electrical engineering research. Under my mentors, Dr. Srdjan Lukic and NSF Fellow Alireza Dayerizadeh, I studied wireless power transfer (wireless charging) of electric vehicles. This project is part of a larger goal to implement two-person ‘EcoPRT’ electric cars that will eventually travel between Main and Centennial campus on a raised track — reducing greenhouse gas emissions and expediting travel at the same time! This REU not only develops technical skills, it promotes professionalism and networking, too. Our mentors helped us improve through technical writing practice, a perfect pitch competition, and poster presentations. I couldn’t imagine a more productive or engaging summer!